Northwest’s Billy Crabtree dribbles up the court in the Mohawks season opening loss to Glenwood Friday night. 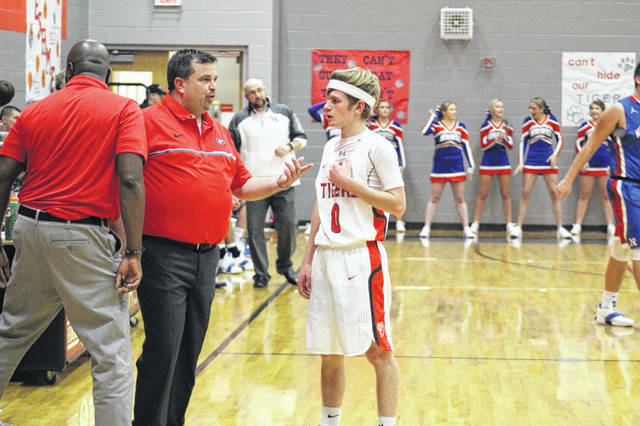 Glenwood head coach Adam Cox talks to his junior point guard, Mal Potts, in the Tigers season opening victory over Northwest 81-39. Marcus Saunders three second half threes helped elevate Glenwood to their victory over Northwest Friday night. 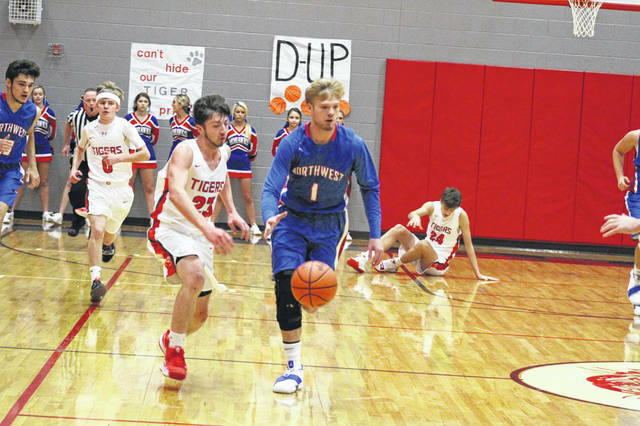 The long wait between the end and start of a new basketball season ended Friday night for the Glenwood Tigers as they were able to claim a season opening home victory over Northwest 81-39. After graduating four starters from last year’s sectional championship team, there were questions as to how the Tigers would be able to replace some of their production from a season ago. Those questions were answered rather quickly as all five starters for the Tigers reached double figures, minus junior point guard Mal Potts who finished with 8 eights. Grady Jackson finished with a team high 20 points, senior Tyler Caldwell finished with 19 points, 17 of which were in the first half, Kyle Sexton finished with 17 points, and Marcus Saunders finished with 14 points, 9 of which came off of three second half threes from the talented guard. The Tigers led after the first quarter over the Mohawks 20-7, and continued on their blistering pace to extend that to a 45-20 lead at the half, all while Saunders sat on the bench in foul trouble, allowing Jackson more freedom to score. As mentioned above, Caldwell had an incredible first half by scoring 17 points, nine of which came from behind the arc. Glenwood kept up their offensive intensity through all four quarters, while also mixing things up on the defensive end to give Northwest different looks in hopes to complicate their offensive production, which worked to a tee. Cox believes that also for the Tigers to be successful, they have to try and guard teams in a number of different ways. The Tigers intense and transitional defense worked to perfection as no Mohawk was able to get into double figures for the night. Junior Braden Borens had a team high seven points on the offensive end, while seniors Chase McClay and Jake Ellis each contributed five points apiece. 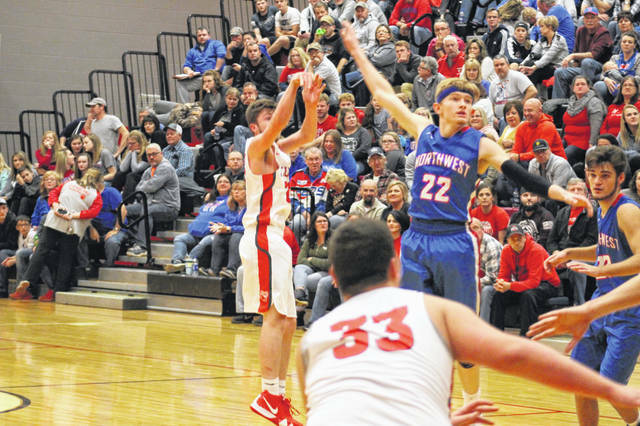 It’ll be a quick turnaround for the Tigers as they will have to travel to South Webster Saturday night in a rematch of their 2018 district semifinals contest. Cox, whose daughter attends South Webster High School and is himself a former middle school soccer coach in the Jeeps illustrious program, is all too familiar with the members of the Jeeps team that his Tigers team will have to face come Saturday night. As for the Northwest Mohawks, they will attempt to regroup in preparation for their game on Saturday as well where they will host another SOC I school, the Clay Panthers.